Tyler Posey & Seana Gorlick – Teen Choice Awards 2013 Kiss! | 2013 Teen Choice Awards, Seana Gorlick, Tyler Posey | Just Jared Jr.
Tyler Posey & Seana Gorlick - Teen Choice Awards 2013 Kiss! Tyler Posey gives fiancee Seana Gorlick a kiss backstage at the 2013 Teen Choice Awards held at the Gibson Amphitheatre on Sunday (August 11) in Los Angeles. The 21-year-old actor was nominated for Summer TV Star: Male, which went to Keegan Allen. Teen Wolf was also nominated for Summer TV Show, which also went to Pretty Little Liars. Tyler and Seana announced their engagement earlier in the summer at the 2013 Comic-Con. ARE YOU WATCHING the Teen Choice Awards? Hosts Tyler Posey & Sarah Hyland Make Their Teen Choice Awards 2014 Entrance! Tyler Posey: I'm Getting Married This Fall! Tyler Posey: Engaged to Seana Gorlick! Tyler Posey: MTV2 Comic-Con Party with Seana Gorlick! 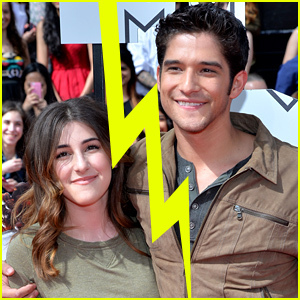 Tyler Posey & Seana Gorlick: 'The Host' Premiere Pair!